Seemingly never destined to visit Vancouver, Guy Fieri rolled into town with his triple-D's crew a month ago. From all reports, he went to such places as The Red Wagon, Save-on-Meats, Fresh Local Wild and Peaceful (among others). Wait. One restaurant kinda sticks out like a sore thumb. Yah, that would be Peaceful. Considered the "better" of the 2 hand-pulled noodle houses on Broadway, it has often taken a back seat to Sha-Lin in terms of publicity. Well, that would be until the airing of Diners, Drive-Ins and Dives in the new year. Other than hand-pulled (or cut) noodles, Peaceful dishes up both Szechuan and Shanghainese fare in a tiny shop only a few stores down from the aforementioned Sha-Lin. When I say tiny, I mean small enough to make Subway look spacious. Despite this, we almost instantly snagged a table. We were lucky though. A lineup soon developed that was 10 people deep. So why is this place so darn popular? Well, for starters, they were awarded the Gold CRA for the best Beef Pancake Roll. At first, I was a bit skeptical. 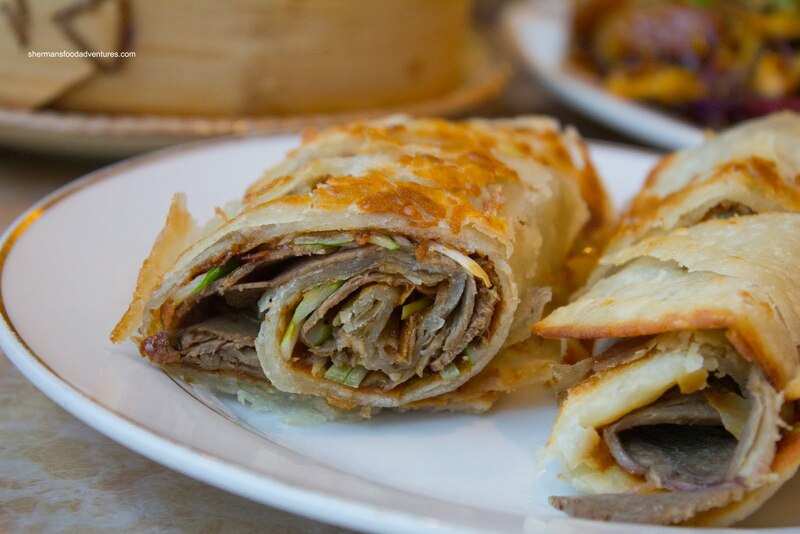 C'mon, how good can a green onion pancake roll with beef be anyways? Well, I ended up eating my own words and a very good pancake roll at that. Normally, my biggest complaint about this item is the thick, dense pancake which often exhibits an unappetizing gumminess. Not here, not even close. The pancake was crisp, flaky and not the least oily. It had a nice pan-fried appearance and was uniform in shape. I found the roll to be the perfect balance of tender beef shank, scallions, hoisin and light pancake. This is one Chinese Restaurant Award-winning dish that I wholeheartedly agree with. Another one of their popular items is the Spicy Marinated Cucumbers. Once again, it didn't disappoint. The cucumbers were fresh and very crunchy. The crisp texture was a party in my mouth while the dressing had some spice. Once again, there was a nice balance of soy, sesame oil and chili pepper flakes. 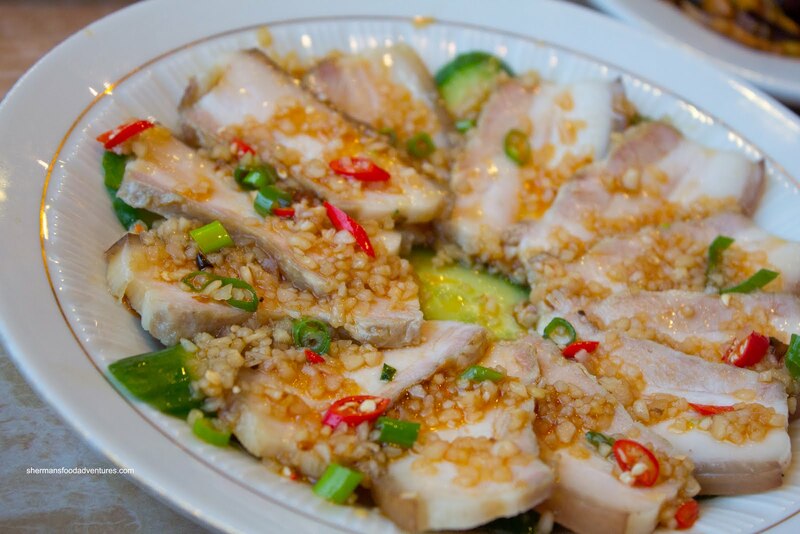 Now the love-in with the food came to a grinding halt of sorts with the Chili Garlic Pork Belly. When I ordered it, our server warned me that the pork belly would be very fatty. That didn't concern me because this dish is typically not for the health-conscious. However, the versions I've had so far consist of thinly sliced pork belly. This one had slices that were far too thick with very tough to chew pork rind. That was probably a result from it being thickly sliced. Moreover, the thick slices made the pork belly unappetizing and chore to eat. It's too bad really since the flavours weren't bad with plenty of minced garlic, red chilis and a vinegary dressing. Okay, back to the good stuff... 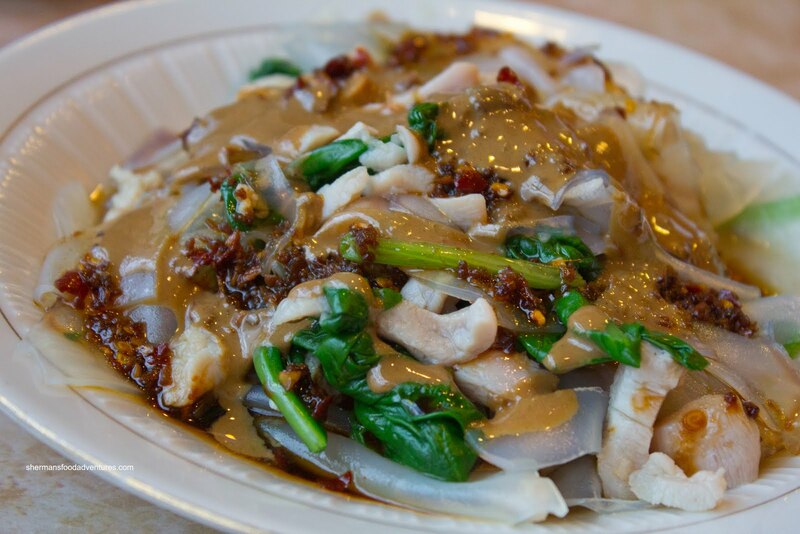 The Chicken and Mung Bean Noodle Salad was a table favourite with a nice combination of perfectly textured noodles (chewy), tender chicken and just-cooked spinach. I found the peanut dressing to be just the right consistency and the perfect combo of peanut, chili sauce and soy. There was a nice kick to balance the sweet and savoury elements of the dressing. 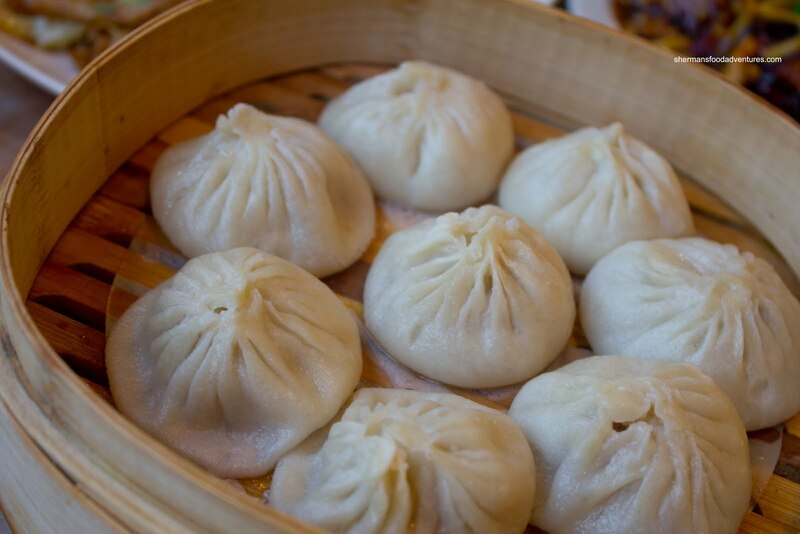 We noticed a few tables with Xiao Long Bao on their table and decided to give it a go. Unfortunately, they looked much better than they ate. First of all, the dumpling wrapper was far too thick and was actually quite difficult to chew through. Second, the meat filling was a bit odd with certain flavours and ingredients (like greens) not normally found in XLBs. Lastly, the amount of soup in the dumplings ranged from a little to none-at-all. In fact, some had popped. I will cut them some slack because they don't specialize in XLBs, but they were no good nonetheless. Now for something they ARE known for - the fresh hand-made noodles. 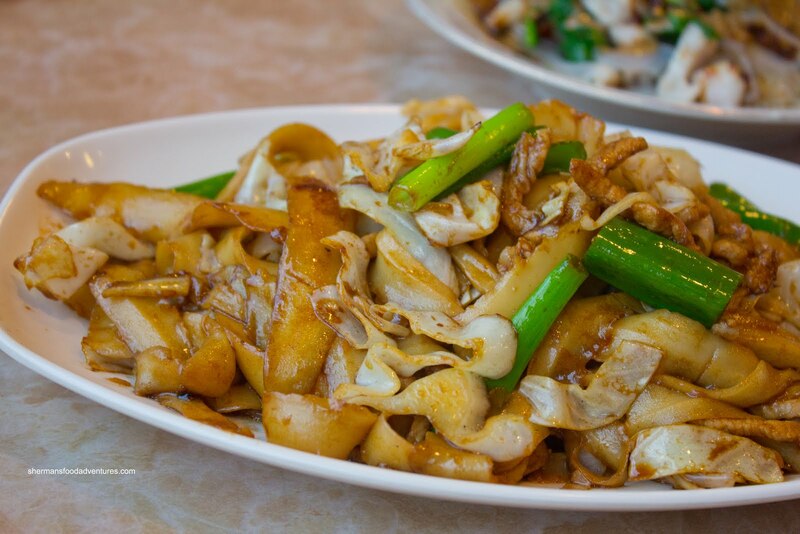 Our first order was the Shanghai Fried Cutting Noodles. These noodles were "cut" from a block of dough, hence they are usually thicker and chewier (if cooked al dente). This was indeed a fine plate of fried noodles. Each thick strand was toothsome and attractively chewy. There was just the right amount of soy to flavour the noodles without being salty. The accompanying cabbage was wonderfully crunchy and sweet. My son couldn't get enough of these noodles (which means it must be good). 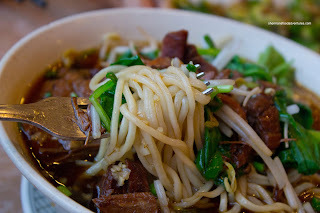 Our second noodle was the Szechuan Spicy Beef Noodles in Soup. Hidden underneath the beef brisket and spinach lay a deceptively large amount of hand-pulled noodles. These were slightly past al dente, yet it was not terribly so. These were also very good and the freshness really shone. The soup had depth and was mildly spicy. Despite its appearance, the falling apart beef brisket was quite most and tender. It was a touch on the dry side due to the lack of fat. 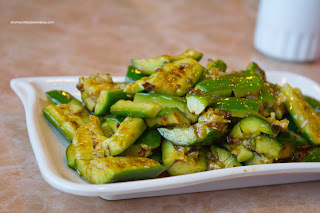 Lastly and the most surprising dish of all was the Chili-Garlic Eggplant. This was by far the tastiest item of the meal. 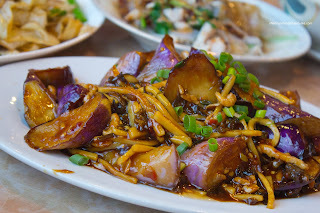 With each perfectly cooked piece of eggplant coated in a silky starch-thicken sauce which was a vinegary, spicy, salty and sweet, we couldn't stop eating it. In fact, we cleaned the plate. The crunchy bamboo shoots and wood ear mushrooms really added a nice textural contrast to the soft eggplant. This was a good end to a mostly solid meal, pork belly and XLBs notwithstanding. And what can I say? I think Guy Fieri got it right this time around. The food at Peaceful (if you order the right items) is "money". At least Fieri is no Rachel Ray *cough*... 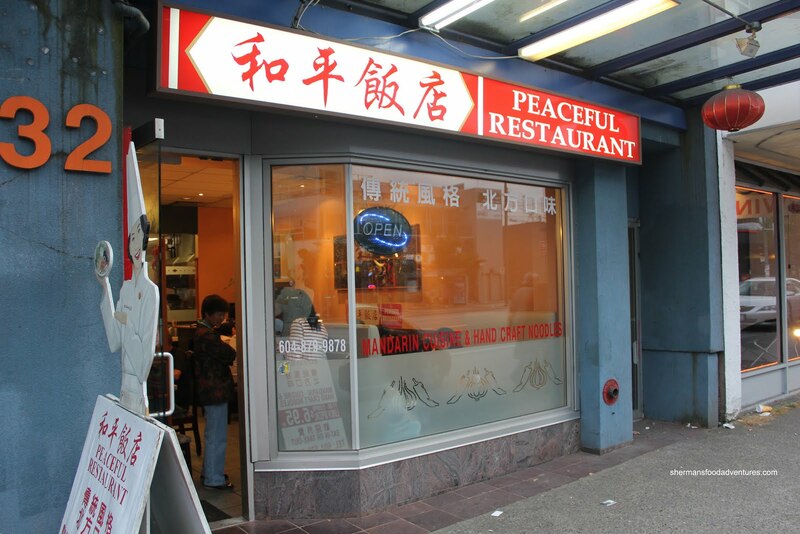 But, still, it begs the question, could he have gone to other Chinese places? And how does Peaceful fall into the DDD motif? But, hey, at the end of the day, if the food is good... (and hopefully "cheap" enough!) Hope they don't generalize by saying it is just plain "Chinese". @KimHo LOL, my posts are actually out-of-sequence. Although I do love Chinese food! Yah, I guess Peaceful is a dive?